This will be just a mini-con report rather than a full-fledged article, because I am trying to catch up on both a) sleep and b) a to-do list of daunting length. I’m really glad that I went to FinCon, and I’m just as glad to be home again. I consider myself an introvert — not because I don’t like being around people, but because I find meeting new ones stressful and exhausting. I can manage to simulate extroversion only in short bursts — in this case, about two days max. By Saturday I was already tapped out and in desperate need of a few days at home with just my spouse and my pets. Which of course I did not get. But before completely losing my social impetus I managed to briefly meet a lot of people and (my favorite part) make a more genuine connection with a handful (hi to Michelle and Elizabeth! ), including the one attendee whose blog I have been reading regularly for most of a year. I had several interesting extended conversations … and a couple too many drinks (cough). Above all I am glad Stacy was there to act as my wing-woman, both because she was a stabilizing and comforting presence in the midst of the social whirlwind, and because at any point I could get the insights and perspectives of a professional journalist just by leaning over six inches and whispering. Of the formal sessions, Liz Weston’s talk on “How to Give Good Financial Advice” had the most impact on me. She was more or less introducing personal finance bloggers to the tenets of traditional journalism, and encouraging us to follow them. I do some of those things already, but I’m now giving serious consideration to a couple of others. There are some aspects to the blog approach (like the focus on personal stories) that I don’t wish to give up, but I’m aiming for a best-of-both-worlds hybrid. There were a couple of sessions that I wanted to see but missed, either because they conflicted with another or because I had keeled over from exhaustion. (Sadly, my chronic rapid insomnia/narcolepsy cycle does not mesh well with a convention schedule.) I’m counting on the video recordings to help me fill in the gaps. FinCon also contributed to the crystallization of my own sense of what I don’t want to do. I’m not going to call anyone out in particular, but some people are pushing ideas about blogging/writing/marketing which strike me as wildly — sometimes even appallingly! — wrongheaded. In retrospect I think I was silly to try to ‘prepare’ for the convention by reading other attendees’ blogs. With 400 people in attendance, the overlap between my randomized pre-reading and the people I actually met was nearly zero. And I’ve concluded that, as the comments to my pre-FinCon post suggested, reading All The Things is neither sustainable or useful in the long run. But I did at least get a snapshot of what other bloggers are currently doing in this field. And if the result is a resolve to deliberately (rather than accidentally) position myself away from the herd, well … I don’t think that’s necessarily a bad thing. Several people have told me recently that they read Pocketmint even though they don’t read any other personal finance blogs, or even any other blogs at all. On Sunday I ended up on stage in front of a couple hundred people, thanks to my pal JD. This was not part of the original weekend plan. I had a vague idea of what he was going to ask me, but had to handle the specifics on the fly. I babbled a little. Gotta work on the public speaking, especially the extemporaneous part. I feel you on catching up on sleep and getting things done. it was a hectic weekend and I myself am a bit of an introvert I was pretty pooped out on starting up conversation after conversation, but I am glad i went! wow.. you must of had heaps to take care of. Im pretty much all caught up even with school work! Glad we got to hang out briefly.. Hopefully we can meet up at next years! Heehee.. it was nice to meet you too. I especially enjoyed the part about “simulating extroversion”. I’ve had to simulate that in the past too, as well as many other handy human characteristics as the situation demanded and my inner robot didn’t seem to have a native program available to run. 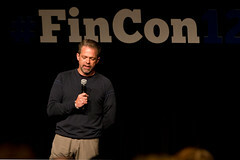 This is Rob Bennett, at “A Rich Life.” I was at FinCon12 too and I also am an introvert. It is a great experience but super exhausting! I mentioned the introvert thing to several people. I have a thought in the back of my head that it would be nice next year to have a place where all the introverts could get together. We need to set up one-on-one meetings rather than these things where you stand around in a room with lots of noise and introduce yourself to people you have never met before. Extroverts love that sort of thing. But it does not work for us! Anyway, I hope to meet you next year. Please take care. I’m not quite sure how that would work — if all the introverts got together, wouldn’t that be a huge crowd all over again? — but if you figure it out, let me know! Last year at FinCon11 I somehow managed to balance FinCon with a vacation to Chicago with a friend. By the time I got home I was exhausted! I can understand how you felt tapped half way through! I am a bit of an introvert myself. LOL! All in all, your recap reminded me of what I enjoyed so much about the experience, though… and that is the learning from others. Hope I can make it to the next one in 2013!